Barcelona forward Lionel Messi has had the yellow card he received in Sunday's 1-0 win at Valencia rescinded. Messi, 27, was booked after he appeared to be struck on the head by a plastic bottle as he and other Barcelona players celebrated Sergio Busquets' late winner. Barcelona's initial appeal was rejected by the Spanish football federation's (RFEF) competition committee. However, a second challenge to a higher appeals committee was successful. 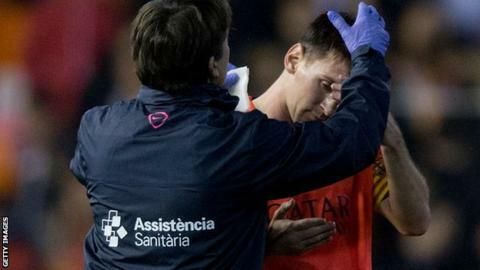 The RFEF said the committee had been unable to detect "deliberate time-wasting" on Messi's part but only "a normal reaction from someone who had suffered an aggression by a spectator".